Our “Books N Blether” group was originally formed after volunteers discussed a common interest in reading. However, the group is open to the whole community and not restricted to Gate volunteers only. The group meet on the first week of every month to discuss, allocate and analyze a latest read. 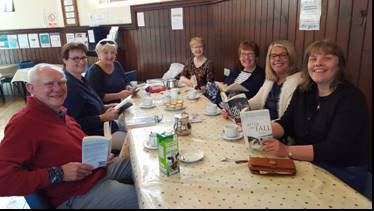 There are currently places available to join this group, if you are interested in reading and meeting new friends then please telephone 01259 218766 for further information. After securing funding, Our Gig at The Gate [previously known as The Old Record Club] is now a permanent project for The Gate. Gigs are held quarterly on a Saturday afternoon from 2pm – 4pm. A small entry fee is applicable. Free refreshments are always available. The Gigs are an excellent opportunity to relax, have lots of fun and exercise through dancing along to the music or singing along to our Karaoke system. The events help people to socialise with others and build friendships and connections whilst overall promoting physical, social and emotional health. 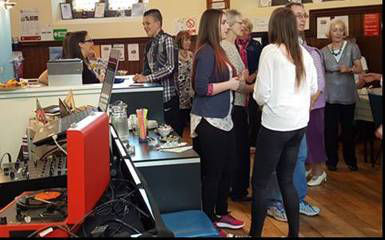 To find out when the next Gig will take place, telephone 01259 218766. Feedback from our service users helped us to understand that there was a lack of informal activity groups within the area. 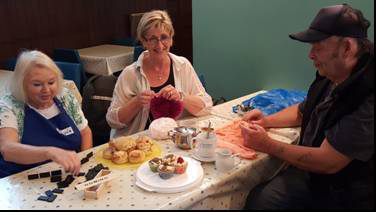 For example, some of our cafe customers informed our volunteers that they particularly enjoyed knitting, chatting with friends, playing games and meeting new people. Therefore, we introduced a “Knit N Natter and Gate Games group” every Wednesday from 2pm – 4pm. There is no waiting list to join and no referral is required. The overall purpose is to provide an opportunity for people to meet in a safe, warm and welcoming environment to share a common interest such as knitting. Come along and join in. You would meet new friends and learn new skills! Groups are FREE to join and tea/coffee is served every week. If further information is required, please call The Gate Centre 01259 218766.